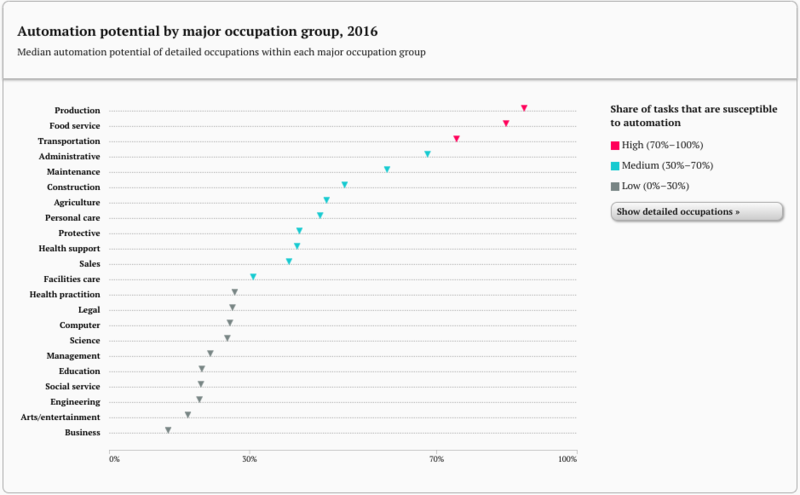 Debates around the effects of the increased use of automation in the workplace have tended to coalesce around the topics of job creation and job eradication. Such discussions frequently cite the impact on specific vertical industry sectors. How badly affected will jobs in manufacturing be, for example. There has also been a lot said about the way in which the effects of artificial intelligence (AI) and automation will be felt differently around the world. But just focusing on the effects of AI on one country – in this case the USA – demonstrates the way in which groups of winners and losers could emerge, polarizing around access to economic opportunity. The decision by Amazon to build a new campus outside of the company’s HQ city of Seattle led to a procession of cities offering incentives as they attempted to woo the giant of e-commerce and entertainment. Despite all the indications that it was a done deal, Amazon walked away from a plan to locate itself in Queens, New York City. Promises of thousands of new jobs all came to nothing, but New York is unlikely to feel as though it has missed out. The first wave of tech and automation, which began in the 1980s, changed manufacturing processes and resulted in many job losses. While the economy benefited on the whole, pockets of poverty developed. Towns that had grown around vehicle manufacturing, for example, fell into decline. The reduction in employment opportunities led to falling economic activity, growing levels of personal debt, and foreclosures of both business and domestic property. To avoid a repeat of this in the wake of AI-driven disruption, plans will need to be put in place, argues Mark Muro, senior fellow and policy director at the research institute Brookings. In his report, Countering the geographical impacts of automation: Computers, AI, and place disparities, Muro warns policymakers against allowing an uneven distribution of opportunities. 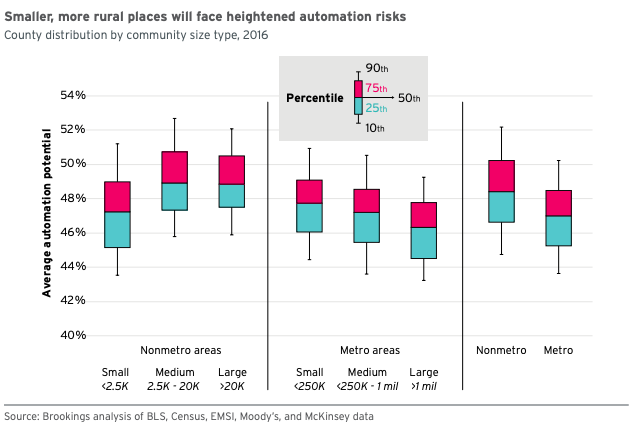 “The data for automation exposure in the AI era show that automation impacts will be most disruptive in Heartland states, counties, and cities,” he writes. “These are exactly the same regions hit hardest by IT-era changes. Research from Brookings indicates that the top 2% of metropolitan U.S. is already out-performing the rest of the country and that AI could widen that gap. Areas already struggling could be those that are hit hardest, yet again. The phenomenon of the left behind classes within blue-collar U.S. is not new; the 2016 election campaign fought by President Donald Trump centred around that premise. While parts of the economy have been thriving, the last two decades have also seen the decline of the American manufacturing heartland and the hollowing out of many communities. The gap between those who are thriving and those more focused on simply surviving may have helped propel the current incumbent into the Oval Office. But it threatens to grow into a deeper division, fuelled by the advance of next-generation technology. This is an illustration of the potential divide in action. Those cities with a talent-rich population in close proximity to places of work, are those that are likely to weather the AI storm better than smaller metropolitan areas. But the overall impact of a growing divide has the potential to be felt beyond their immediate environs.